Milan Tobacconists offers a wide variety of fine cigar lighters for the discerning smoker at reasonable prices. 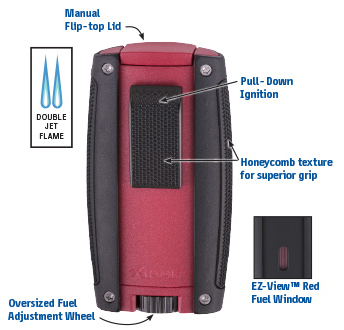 Only our most popular brands, such as these XIKAR Turismo cigar lighters, are listed on this site. If you are unable to easily locate a particular lighter, please give us a call at 877.70MILAN or send an email to customercare@milantobacco.com. We'll do our best to make a match! Retail Price: $59.99 USD ~ Internet Price: $50.95 USD!